The 2018-19 Premier League season will see a return of Cardiff City, Fulham FC and Wolverhampton Wanderers to the glamour of the top flight. Each of the three teams has earned their place in the Premier League but none more than Wolves, who raced away to the Championship title with a staggering 99 points! Wolverhampton Wanderers fans will be looking for their club to reach new heights under the new found wealth. The fans will be hoping for more than just safety in the Premier League and with the finances at their disposal, there is no shame in being optimistic this season. However, Wolves were once the most dominant team in English football. During the 1950s, the English First Division was a very competitive league with seven teams winning the league from 1950 to 1960. Man United and Wolves won the league for 3 times during that decade. Wolverhampton Wanderers have won the league three times in their history, and all them coming in the era of the 50s, the first of which was won in 1954, where they piped local Midlands rivals West Bromwich Albion to the title. This was a time before the concept of UEFA Champions League or European Cup was born so there was no tournament were the champions from each European country would come and take on each other. So, clubs usually used to play some high profile friendlies against top oppositions and check their worth and level. During the early 1950s, Hungary was considered to be the greatest national team to play the game. The team had the likes of Zoltan Czibor, Sandor Kocsis and the legendary leader in Ferenc Puskas. They had just won the Gold at the 1952 Summer Olympics and were all set to take on the world. Surprisingly, the core of the Hungarian team came from the country's top team named Honved FC, the team owned by the Hungarian army. Wolverhampton Wanderers and Honved were both on the rise in their respective countries. 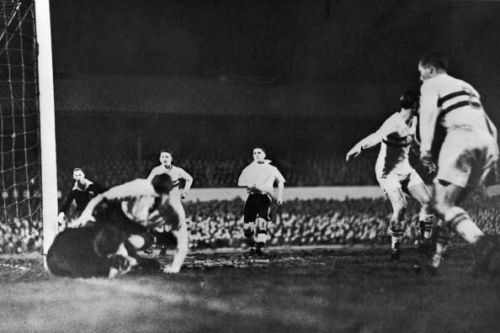 In the 1950s, Wolves were one of the first clubs to install floodlights in their stadium and started playing telecasted floodlit friendlies against top European clubs. A clash between the champions of the best national team, Hungary and the champions of the creators of the game, England was inevitable. So, on 13th December 1954, that day came when Wolverhampton Wanderers hosted Budapest Honved in a friendly under the lights which was broadcasted live on BBC. It was one of the greatest matches of that time. The Honved tactics were on point and were 2-0 up within the first 14 minutes, thanks to goals scored by Kocsis and Machos. The super quick passing game, similar to that of the Hungarian team was bamboozling the Wolves side so much that at half time the Wolves manager Stan Cullis ordered the staff to water the pitch to prevent the Honved players from playing their high pressing game. The technique worked! Wolves rallied home and scored 3 goals in the second half to win the game by 3-2. Jonny Hancocks scored a penalty early in the second half and Roy Swinbourne scored 2 goals in 2 minutes to wrap up the game. Wolves long ball tactics not only helped them turn the tie against the quick passing game of the Hungarians but also saved them from an absolute thrashing by the hands of Honved. The result really mattered, not only to Wolverhampton Wanderers but to English football in general. Prior to this game, England had faced Hungary twice in international friendlies and both time they were humiliated. In 1953, Hungary defeated the hosts England 3-6 in front of 105,000 spectators at the Old Wembley in the game which was termed as the "Game of the Century". In the reverse fixture in Budapest, England were again battered 7-1 by the Mighty Magyars. The Wolves win had proven that English football was "the genuine, original, unbeatable article... still the best of its kind in the world." Wolverhampton Wanderers manager Stan Cullis along with the English press labeled the Wolves side as the "Champions of the World". This game is widely regarded as the most important game in the creation of the European Cup which was later rebranded as the UEFA Champions League in 1992. Though Wolves are no match to European giants today, their contribution to creation of world's greatest club competition is immense and should never be forgotten. They were the Real Madrid of Europe before Real Madrid took the European Cup by storm and became the superpower they are today. Wolverhampton Wanderers created a niche during the early 50s in firstly playing games under the lights and then broadcasting friendly games to earn more revenue and to reach out to the masses. The Wolves manager and the board were well ahead of their times and had a vision of how modern football will be in the future. The club was visionary and carved out a path for the other European clubs to follow. Though they have never won a European competition, they were surely unsung pioneers in creating a European revelation! Who knew just one match would hold so much importance in framing the European footballing history.